Greater Nutrition, More Affordable, Greater Results! Note: Barleygreen is no longer used with the Hallelujah Diet due to decreased quality. BarleyLife is now the freshest, most nutritionally dense and cost effective barley juice powder available and is yielding tremendous results to users. 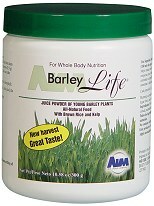 We are excited about the dramatic improvement that BarleyLife brings to the Hallelujah Diet. We now highly recommend BarleyLife over Barleygreen. You can feel the difference, it is that much better! I want to stress that vitamins in BarleyLife have not been isolated and then recombined, but are, rather, still in their natural (chelated) form, bonded to other nutrient factors as nature created them. Throw together similar amounts of isolated or man-made chemicals, and you will NOT produce the same effect. What is Barleygreen and How is it Made? Save money on Barleygreen - Buy Direct!